This is one I suspect we’ll be fighting about. 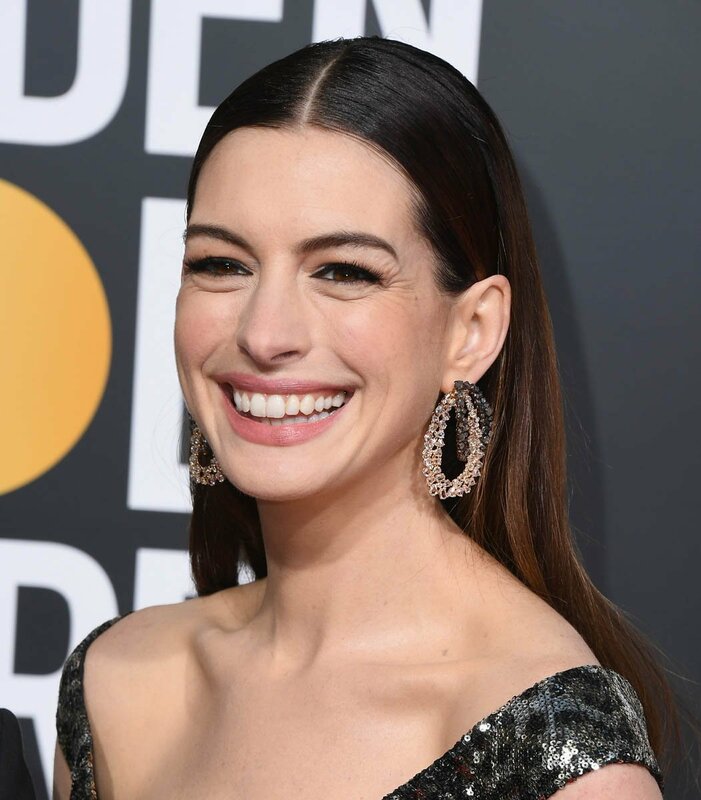 There’s a lot of online hate for this look on Anne Hathaway. USA Today is calling it a “misguided travesty”. Um, they also put Rosamund Pike on their Worst Dressed List and, as Duana has already established, no one came close to Rosamund Pike last night. We all wanted Rosamund Pike for Best Dressed. But Duana’s right – it’s almost TOO easy for Rosamund Pike. It’s all the time with Rosamund Pike. It’s kind of becoming all the time with Annie now too, since she started working with Law Roach. Pre-Law (ha!) it was good…but it wasn’t always imaginative. Looking back, now that we’ve seen Annie’s full style potential with Law, Annie’s greatest hits were often slinky, within a certain shape standard. With Law, she’s moved away from one silhouette to all silhouettes. She can do body-con but she’ll also go layered and asymmetrical, from wide billowing dresses to drop waists to suits to belted flare skirts and so many fun prints. Here’s a fun print – one of the only prints of the night. Right? Think on it. 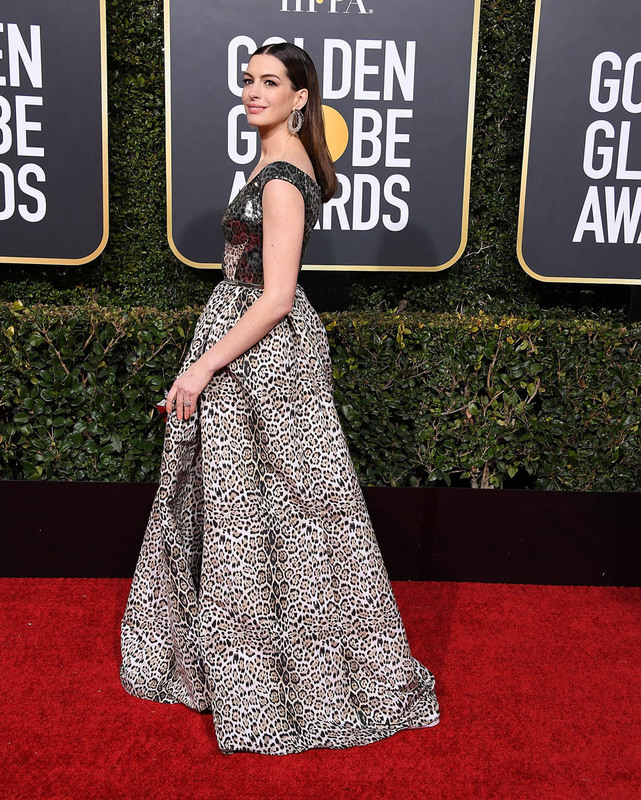 Did you see any print at the Golden Globes? There was sequin and lace, there was taffeta and silk. There were bold colours and neutrals and bright whites. But there was very little print. Law put Annie in print. And not just any print – but ANIMAL PRINT. On a major award show red carpet. In different textures, cut into a basic ballgown fit, and thereby creating a balance of classic and unconventional. What more do you want from your Best Dressed? This is what a Best Dressed should be: a look that feels fresh, a look that isn’t interested in boring but also a look that manages to keep its wildness at the level of its wearer so that it doesn’t overwhelm her or underwhelm her but suits her perfectly. And she knows. You can tell. Few people looked like they felt as great as they looked last night. Annie looked amazing. And she looked like she FELT amazing. She was not doubting this dress, not for a minute. It was the one. The absolute right, best one.